One of the front runners in the Hel Performance British Motostar Championship Moto Three class over the past couple of seasons, Kilmacrennans Richard Kerr, has decided to change classes for the forthcoming 2018 season. 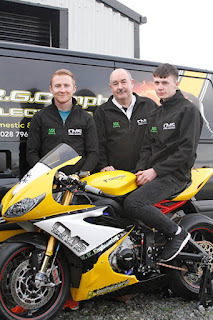 The 17 year old student will switch to the Dickies British 600 supersport class on board the Campbell Motor Sport 675 Triumph. The bike is owned by business man Robert Campbell and is looked after by Triumph Engineer Simon King. Standing at 5.10 ft, Richard admits that he was having trouble getting tucked into the moto three machine, but should feel much more comfortable on the bigger machine, on which he will get his first run on the “Campbell Motor Sport Triumph 675r “ when the team go for a four day test at Almeria in January. Finishing 4th in the British Championships this year, Richard who scored no less than 8 podium finishes in the British Championships, began his career in junior moto cross before taking to the tarmac in 2013, where in his first season he clinched both the 125 and newcomers championships. After joining forces with Bob Wylie Racing, Kerr tackled the British Moto three series, with a best result of Third at Cadwell Park. This past couple of seasons, Richard has raced the NWR KTM, and is the present Bishopscourt, Kirkistown and St Angeleo Moto Three Lap Record holder. The Donegal rider is presently concentrating on the 2018 season, knowing that he will have to re adapt his riding style, The quietly spoken Kerr is training on a daily basis and is confident that he can bring the team top ten results before the season is over. “Campbell Motor Sport”, headed up by Electrician Bob Campbell, who has been involved in Motorcycle racing since the early nineties, and partnered with Mark Johns for many of those years to field riders like Milky Quayle, Ian Hutchinson, Marty Nutt and Nico Mawhinney. Following a step back from racing for a number of years, CMS have been planning an assault on the Dickies British Supersport championship, with Bob's two sons Mark and Simon King, building the new Triumph Daytona 675R for the task. The build has taken approximately two years with substantial engine development taking priority, Simon, who works as an Engine Management Engineer for Triumph at their factory in Hinckley, and Mark, a Precision Engineer, have used the time to try new concepts and manufactured their own prototype parts and are confident the bike will be competitive following development in preparation for this season. Simon worked with Richard during his final Moto 3 season helping with Data analysis and engine development and spotted that he would be an ideal candidate to ride the Triumph next season! The team is supported by R.G. 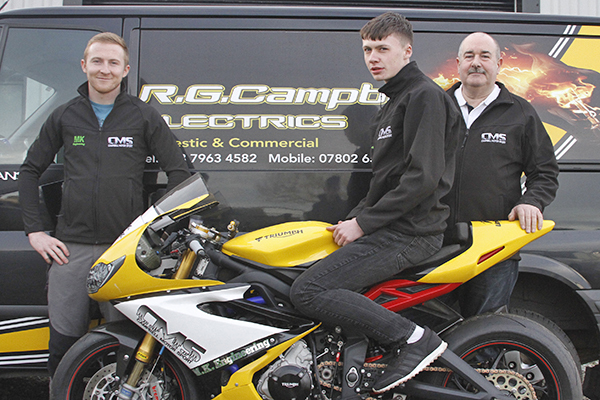 Campbell Electrics, Biohazard Performance and M.K Engineering and looks forward to working with Richard in 2018. Richard Kerr would like to thank Campbell Motor Sport, Robert Campbell, Simon King and Mark King for this great opportunity and all my sponsors Amanda Sheridan, Reuben Sheridan, Lennon Logistics, Laverty Mobile Catering, Lisnagalt Lodge Bed & Breakfast, Edgar Scott, McCarville Cars, Donegal Gearbox Rebuild Services, KER Group, Campsie Karting Centre, Callaghan Transport, K.P Engineering, Micad Security, Motoworld, Mc Fadden Body Repair and Mark Kelly, Dad and my Family.